Who are Ready for More! You loved the striking, yelling and empowerment you got from Ladies’ Fight Night, and now you are ready to step it up a notch. Know what to do if you are attacked from behind, choked from the front, or thrown to the ground, which adds to your fierceness quotient! 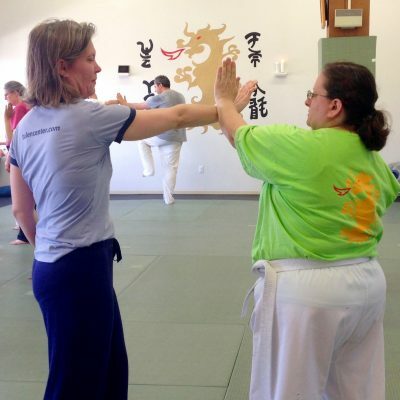 Increase your repertoire of verbal defense strategies and create even stronger boundaries. Become the superhero you were meant to be! There is only so much we can cover in the two hour Ladies’ Fight Night classes, but with just a bit more, with a three- or six-hour investment of your time, the pay off is ten fold as you become safer and more empowered in all areas of your life. Invest in a three- or six-punch card. Pick your first class and show up ready to learn! And, of course, each class will include a review of your favorites, like using your voice and striking. Bring a water bottle and wear comfortable clothing you can move in. No shorts, please. We follow the Beaverton School District for inclement weather closures. Will you teach me about weapons? We can do that! If you want to learn about facing, dealing with, defending against and disarming guns, knives, clubs, rifles, chokes with ropes, etc., we would love to teach you. It’s more than we can do in just a few hours though, because you need more instruction and practice time. Contact Silvia and she’ll get you started! I've taken self-defense classes at other schools, do I have to take Ladies' Fight Night from you or can I just get a punchcard? Good question! 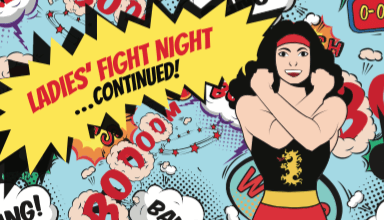 It’s a good idea to take Ladies’ Fight Night first since the information you have learned elsewhere might be quite different. I’d like you to have the same foundation as everyone else.